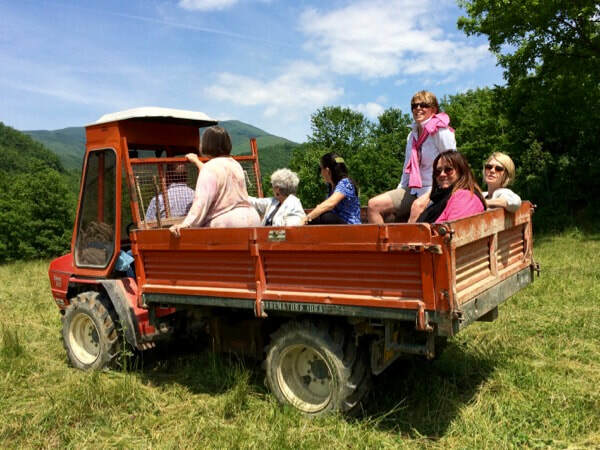 This small-group tour takes you to visit the last of what was once a thriving tradition in the region around Lucca, in northwestern Tuscany, producing textiles ranging from rich silks for the church and aristocracy to the hand-spun hemp of farming families. 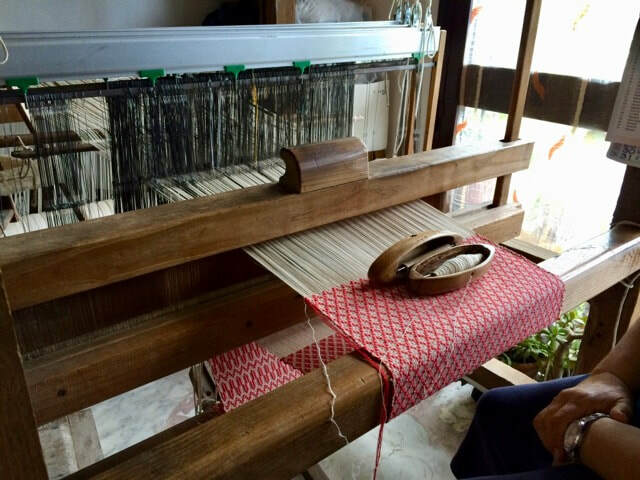 You meet and learn with the artisans who are carrying on the methods of spinning, dyeing and weaving handed down the generations. They invite you into their homes to share meals with them and teach you to cook their traditional dishes, a cuisine with its roots in the farms of the textile artisans. Very small group (only 8–10 guests). 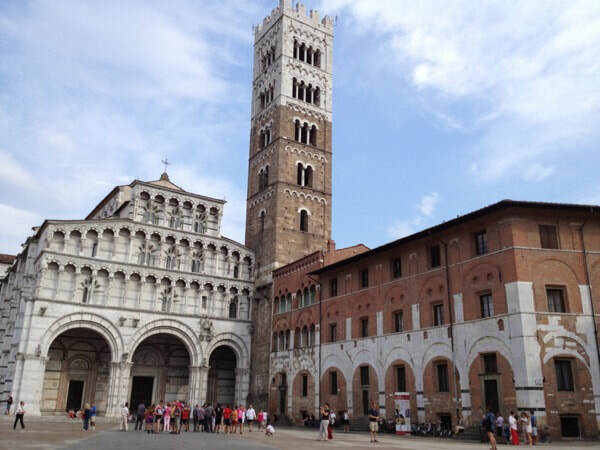 ​Transfer from Pisa airport, Pisa Centrale or Lucca train station to Ai Frati, Pieve Fosciana. Our host Luigi welcomes us to his former Franciscan monastery (see accommodation tab) and prepares a welcome dinner for us. 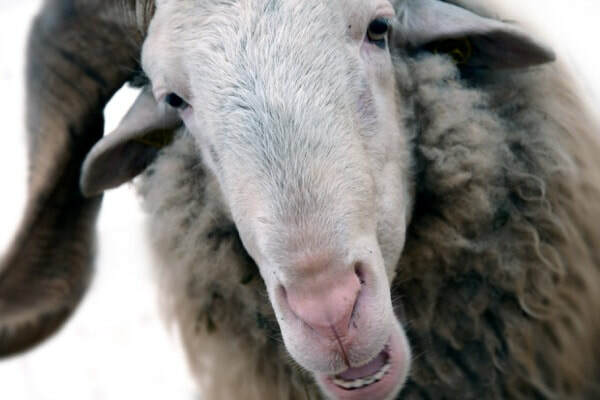 The Cavani family at Cerasa farm is helping to save the traditional Garfagnina breed of sheep by making pecorino cheese from their milk, selling their meat and using their wool. 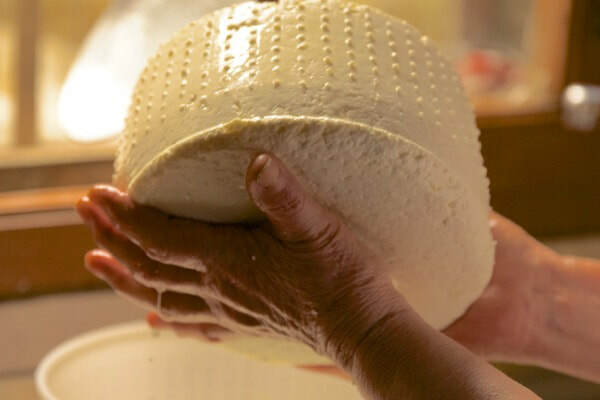 Mamma Gemma shows us how she makes pecorino, and we find out why ricotta isn’t cheese. 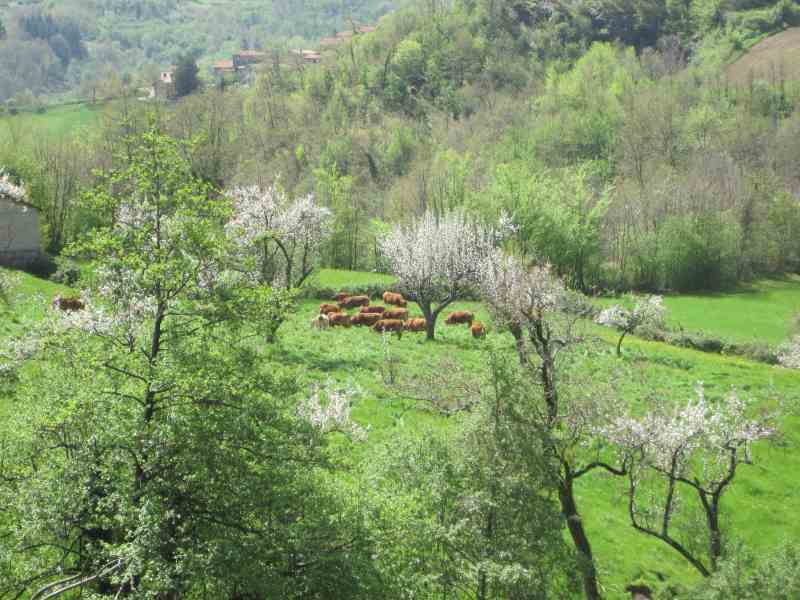 We go out to see the sheep grazing on the mountain pasture and the centuries-old chestnut trees, of which the Cavani’s are also custodians. Gemma and her daughter Ombretta prepare our lunch which includes Papa Mario’s salumi (home-cured pork). 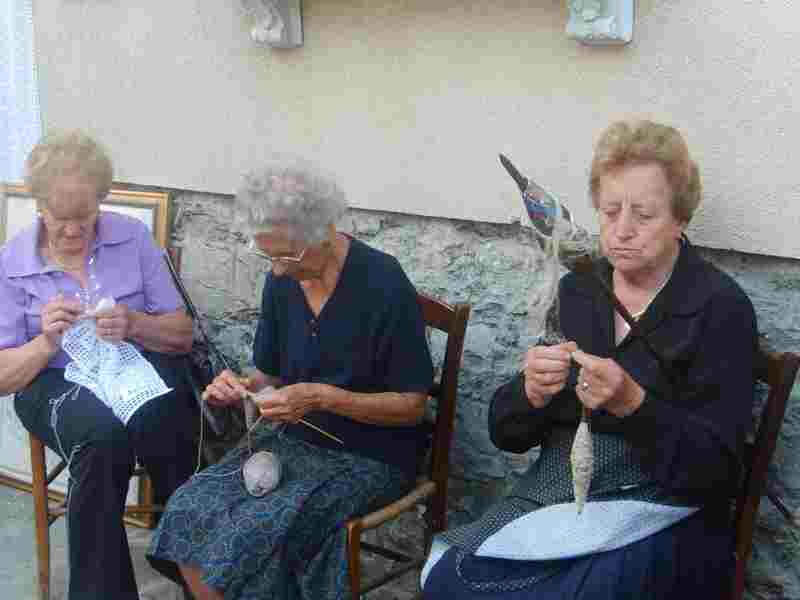 Ombretta is in charge of the wool, and her passion is felting. 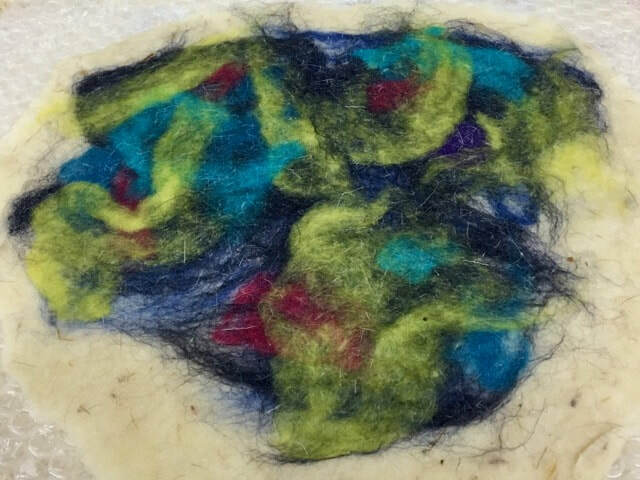 As she leads us in a felting workshop, she tells us about the problems she has encountered trying to have the wool of this antique breed processed in a country focused on merino. 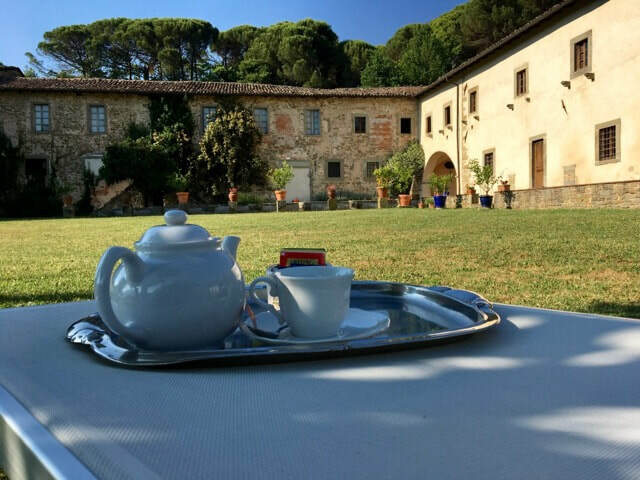 Free time to relax at Ai Frati, set in gardens with fruit trees and a swimming pool and surrounded by chestnut woods threaded with trails. Dinner in the bandits’ village of Sillico (no brigands have been seen recently). 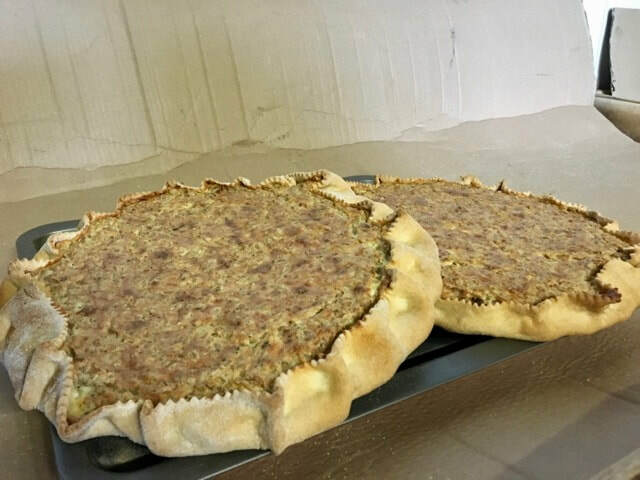 Today we go to the mountain village of Petrognola to learn to make traditional Garfagnana potato bread with the village baker, Paolo Magazzini. While our bread rises, we’ll see the colossal farro-polishing machine. Farro (emmer) is an even more primitive wheat than spelt and is still grown today on terraces around the village. While our loaves bake in the wood-fired oven, Teresa Bertei demonstrates spinning hemp with a distaff and drop spindle and will be delighted if you’d like to have a go. 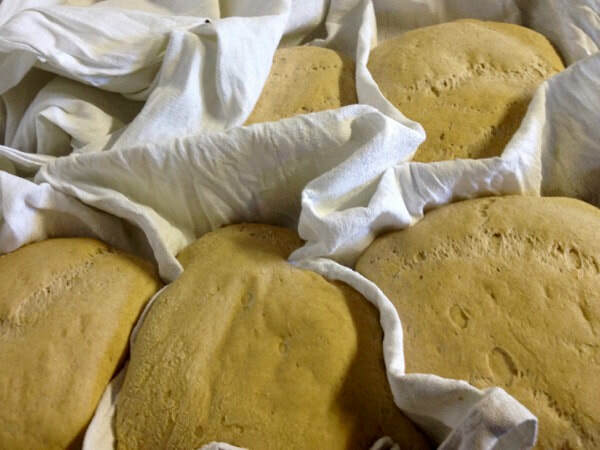 Lunch, cooked by Paolo’s wife, will be the bread we baked with typical dishes made with farro and washed down with excellent craft beers made with farro by an inhabitant of the village (wine and water also available). Supper at Ai Frati. In the morning we have a private tour of the Laboratorio Maria Niemack in Lucca. Niemack made a definitive collection of traditional local textiles and dress, handsome and simple fabrics made of wool, cotton and locally grown hemp; the collection includes a variety of traditional floor looms. 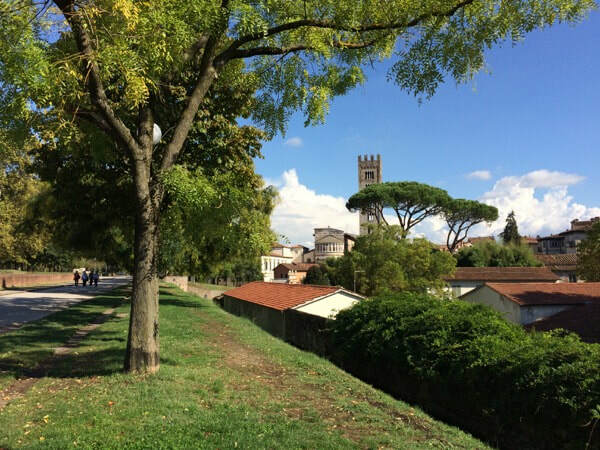 You’re free to spend the rest of the day sightseeing and shopping in Lucca. There’s an especially good yarn shop and three shops with scarves and clothing woven on the premises. 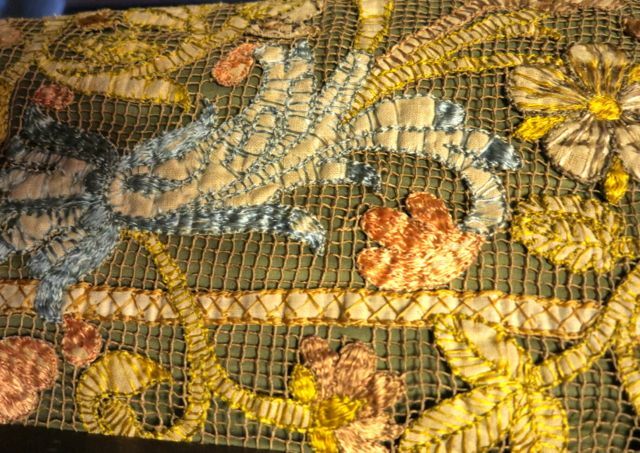 Lucca’s wealth in the Renaissance was founded on silk and banking. 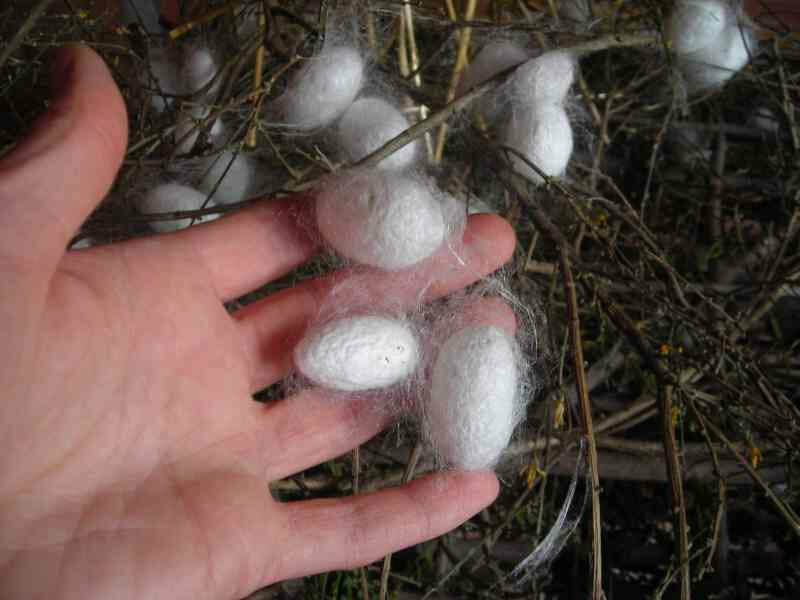 The last of the silk trade disappeared before the Second World War (the banks are still here). Those who want to learn more about the history of silk in Lucca can have a guided tour with Stefania (optional extra, please book when you arrive). Dinner in a former laundry and dyeing establishment. A lazy morning to sleep in after our exciting day in Lucca. Late morning we’ll visit Ermanna Rocchiccioli. 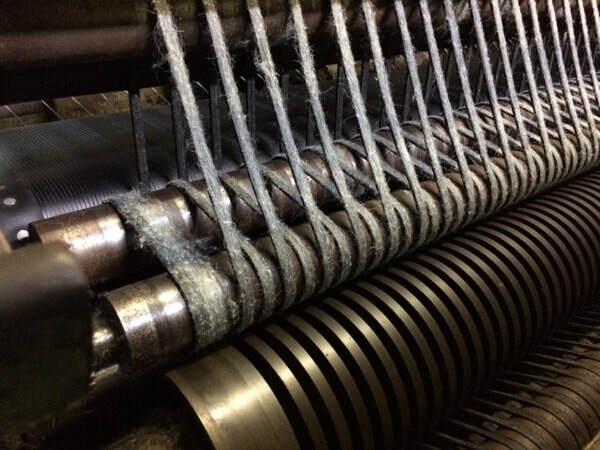 Now in her 80s, she has a fine collection of pieces from her long life as a weaver. Sightseeing and lunch in Castelnuovo at Andrea Bertucci’s parallel gastronomic universe the Vecchio Mulino. This afternoon Alessandra arrives to give us a cooking lesson in which we’ll make ravioli with Gemma’s ricotta and nettles we pick ourselves. 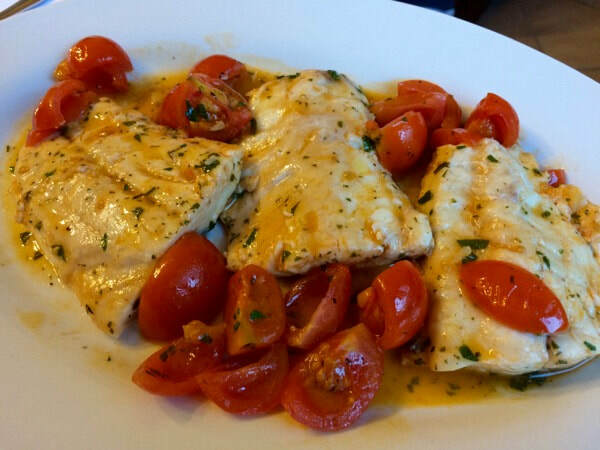 We’ll also learn several classic Tuscan recipes for using up stale bread. Dinner eating what we cooked. 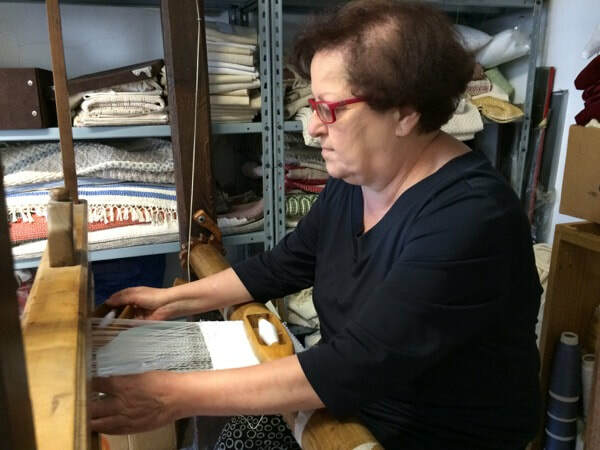 We visit Marina Donati whose weaving prowess has helped preserve the traditional patterns of the Garfagnana. 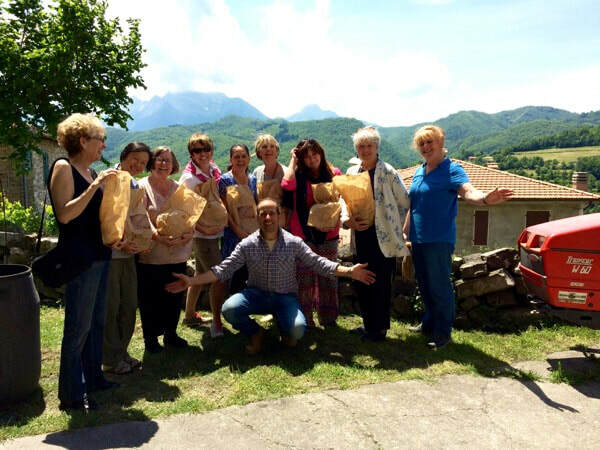 On our way to Barga we stop at a working water mill just like the one where Paolo has his farro ground. Next we drop in to see Francesca Buonagurelli, my friend and beekeeper, who gives us lunch under the spreading cherry tree in her garden. We’ve brought some of Gemma’s pecorino so you can decide whether you like it better with acacia or chestnut honey. 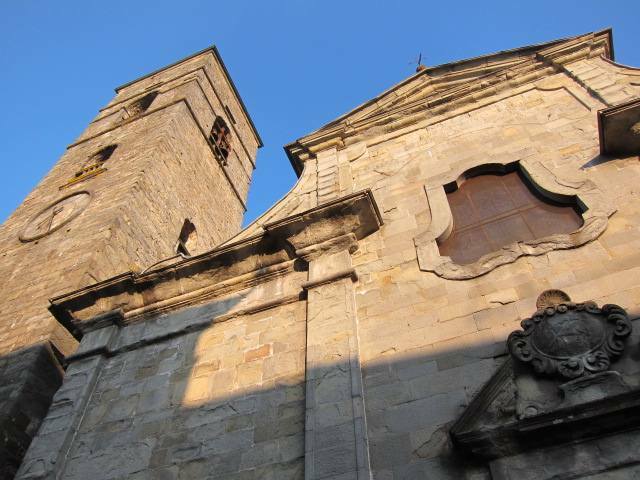 Sightseeing in Barga with its sublime romanesque cathedral followed by dinner on antique porcelain in a seventeenth-century villa. This morning we head to San Pellegrino in Alpe, high in the Apennines, to its ethnographic museum, full of weird and wonderful objects that will provoke many a game of Twenty Questions. Lunch in the village, after which we follow the crest of the Apennines to Cutigliano and Silio Giannini’s filandra, a carding, spinning and weaving mill where you’ll find yourself knee-deep in boxes and sacks of wool and machines of an uncertain age that surely should have broken down 60 years ago. We end up in his office shop where there are bargains to be had. In the late afternoon we meander down the Lima Valley through Bagni di Lucca (the ‘baths of Lucca’), known for its thermal springs and illustrious nineteenth-century visitors Byron, Shelley and the Brownings. Time to pack before dinner at a restaurant with only two tables. We bid farewell to Luigi and depart from Ai Frati. Our next stop is Villa Torrigiani where our private tour takes us behind its extravagant baroque façade to an interior where original silk bedclothes mingle with granddad’s needlepoint. 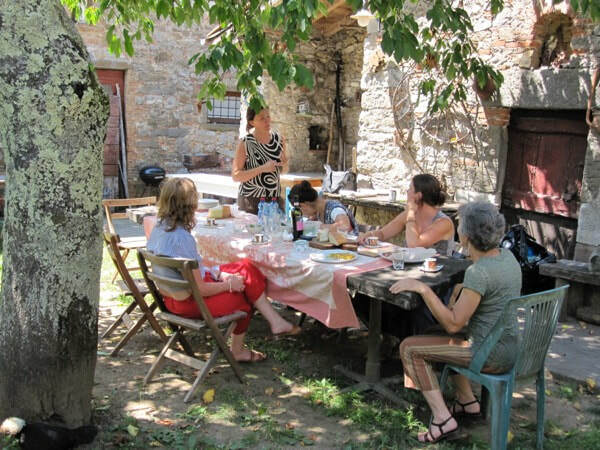 Cheesemaker Monica Ferrucci has prepared lunch for us at her agriturismo, where besides tasting her delicious cheeses, we can visit her cashmere goats. Knitted and woven items will be on sale. 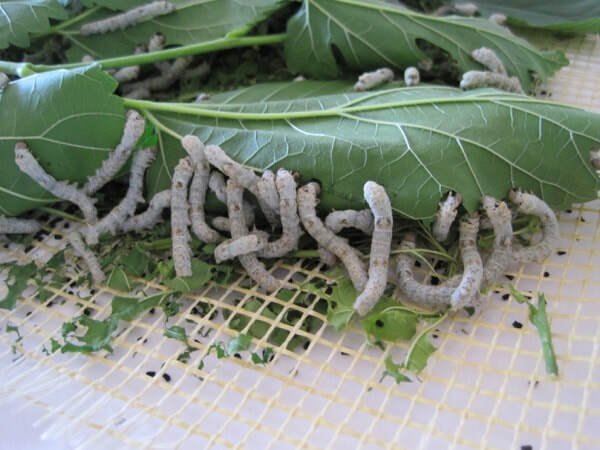 We can’t dally too long since Stefania’s ravenous silkworms await us to give them their perpetual lunch. 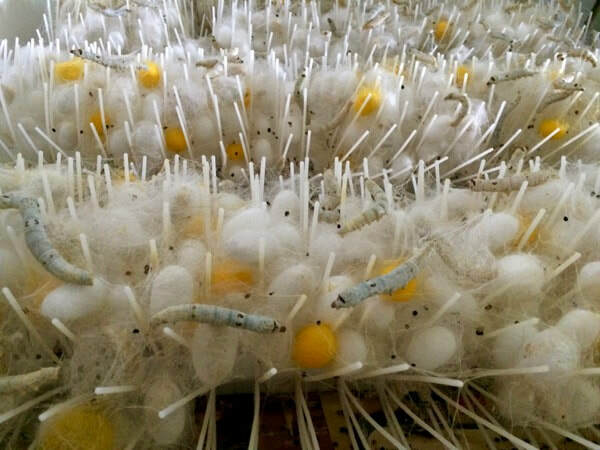 Stefania illuminates the complicated process of turning the cocoons into fabric. 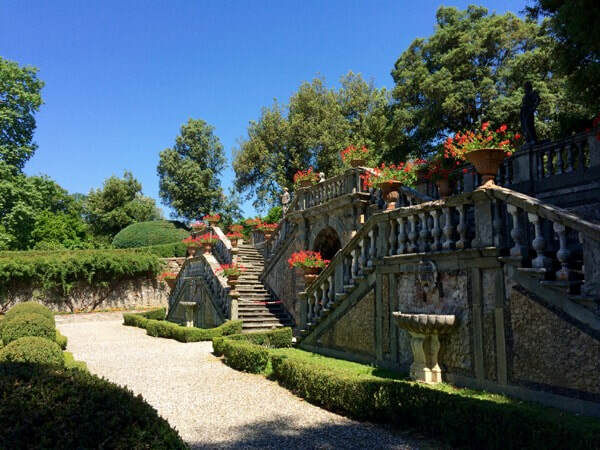 Our driver transports us to Villa Lombardi, Camaiore, our home for the last two days of the tour. 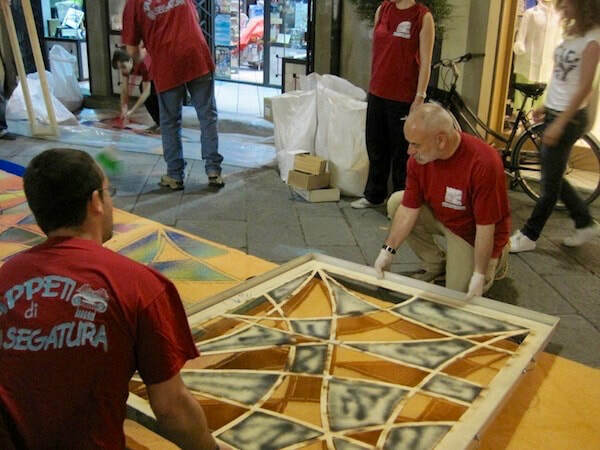 We’ve come to Camaiore because on the eve of Corpus Domini the whole town gets involved in creating carpets of coloured sawdust down the middle of the main streets, using a process not unlike screen printing. Since they start after dinner, first we dine on a glass terrace suspended above a mill stream. 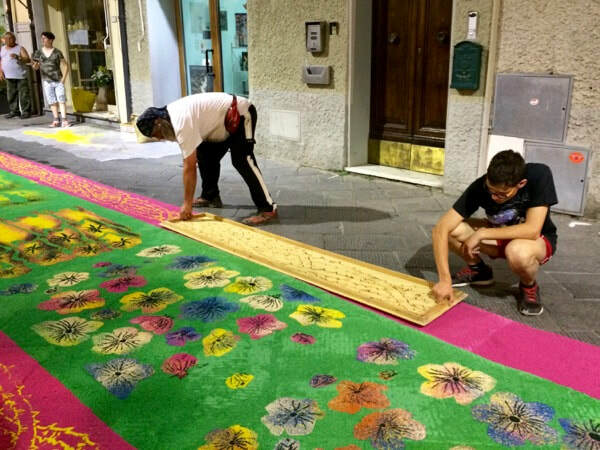 Despite the delicious breakfast at Villa Lombardi, it’s tempting to rush out early to see the finished street carpets and religious procession. Late morning we’ll go to Elena Giannini’s farm. She uses her sales of eucalyptus leaves to European flower markets to subsidise her passion for preserving the traditional crops of the north Tuscan coastal plain, among them cotton, rice, peanuts and broomcorn. After lunch prepared by her family, her octogenarian father teaches us how to make hand-brushes from broomcorn and dusters from marsh grasses. Farewell dinner at Gabriella’s home near the sea, where she prepares the best seafood meal you’re ever likely to eat. After breakfast, transfer to Pisa airport or train station. One transfer will be provided no earlier than 9.00 am (allow an hour to get to Pisa plus check in and boarding time). If you need to travel earlier, a taxi can be arranged at your own expense. A 14th-century monastery in an idyllic mountainside setting. Each ample apartment is composed of three monk’s cells. Despite its tranquil hidden location, Napoleon’s troops found it and destroyed its chapel, but left the cloisters and their frescoes for us to admire. Swimming pool, wifi, magnificent views. A family villa that has been restored preserving its historic features. Maria Grazia Lombardi is the perfect hostess and serves mouthwatering breakfasts. Pisa airport, Pisa Centrale train station, Lucca train station. Please arrive by 2 pm at the latest. Exact pick-up time at each place will depend on arrival times of people on the tour, and will be advised nearer the tour date. One transfer to Pisa airport or railway station (not Lucca) will be provided no earlier than 9.00 am (allow an hour to get to the airport or station plus check in and boarding time). If you need to travel earlier, a taxi can be arranged at your own expense. Tour takes place in the mountains. You must be fit enough to walk on steep cobbled streets and rough farm tracks. Not suitable for people with a fear of heights. ​The tour was amazing. Every day was full of new adventures. I learned a lot and met wonderful people. I couldn’t have asked for a better experience. 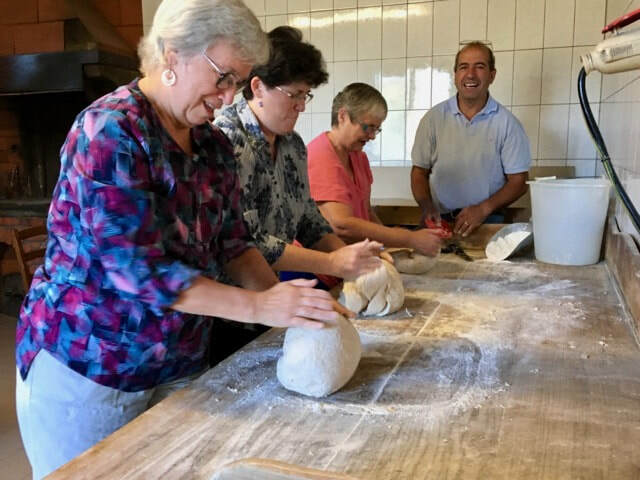 ​We have so many great memories of the tour – it was a huge privilege to be able to have such a personal glimpse into the lives of real people, and we so enjoyed focusing on a small piece of Italy at a relaxed pace. It was exactly the kind of experience we were hoping for – thank you so very much! Because of you, I had the trip that I had always wanted to make to Italy. I am thanking you for all the research, hard work and patience. I urge anyone who is able to travel to go with you. I believe that your tour was the best I have ever been on. I was so impressed with your knowledge of the locals and local sites to visit. It was a very impressive selection and the mountain vistas are with me every day still. The tour was great. The food was amazing and I really enjoyed the meals, including the four courses, the wine and the great company and conversation. Very civilized. I also enjoyed wandering around the chestnut grove and their history, as well as the history of the region. Ai Frati was a wonderful place to start the tour, so restful. Thank you for the tour and the insight into Tuscan life both old and new. The company was wonderful as was the accommodation and the food. Highlights for me: the taste of wild strawberries at Ai Frati, seeing Paolo's limousine cattle, seeing inside Marina's weaving studio, the Museo Etnografico Don Luigi Pellegrini, walking in the gentians at the crest of the Apennines, and the street carpets at Camaiore in the rain. As we travel on our own after your tour, I have come to realize what value you added by sourcing some of the best cuisine. It’s very hard to do this on our own, and I have been disappointed in our attempts to find authentic Piemontese food, for example. 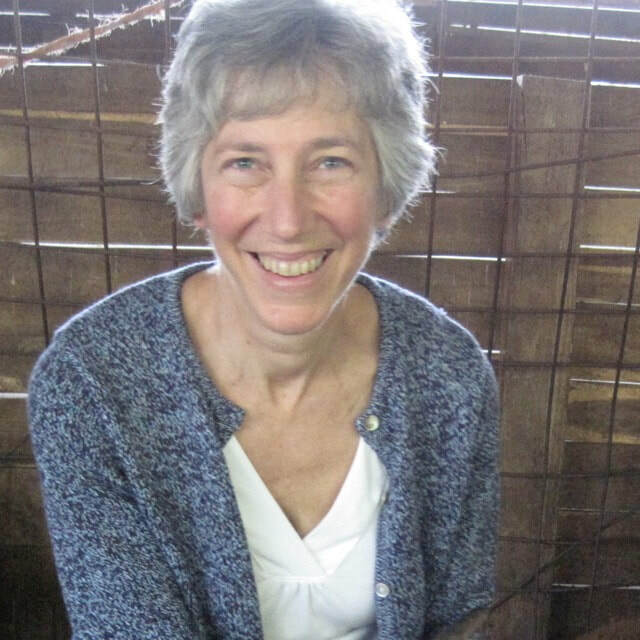 I joined the course with Erica last May as a break from home, my husband was very ill. It was the most wonderful week! 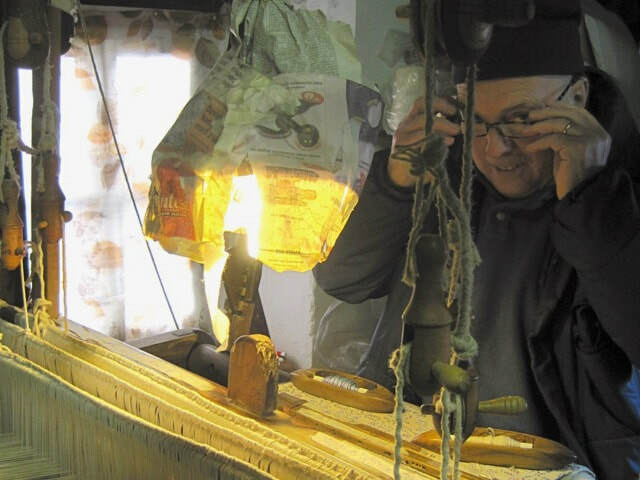 We had the privilege to meet many people in their own homes and experience their passion and enthusiasm for their cheese, textiles, bread, life. 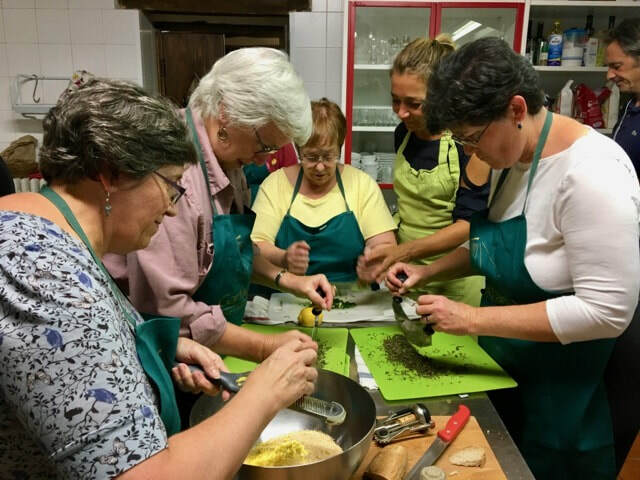 The small group allowed us to be flexible and experience things a larger group would not be able to — hands on cooking, dinner in a family home. 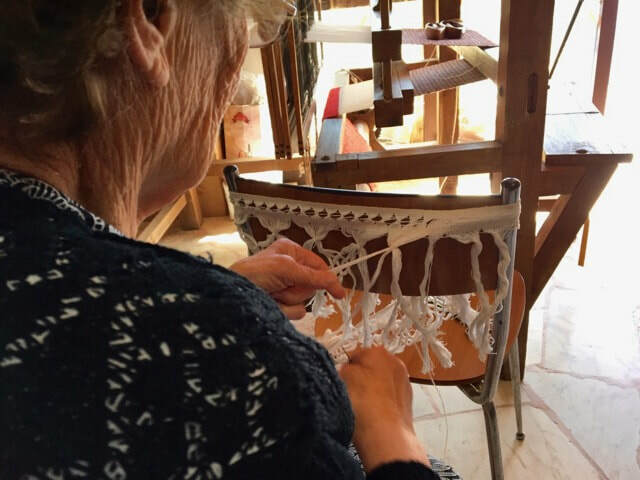 The people on the course had an interest in textiles, weaving, dyeing, woodworking making looms and spindles, as well as other varied interests. Spending a week with this group, I have met people from Canada and Vienna as well as the UK. I am currently booking my next course for next spring. This is a tour for those who want to get below the surface. You will meet extraordinary people, share meals with them in their homes and watch as they keep ancient traditions alive. 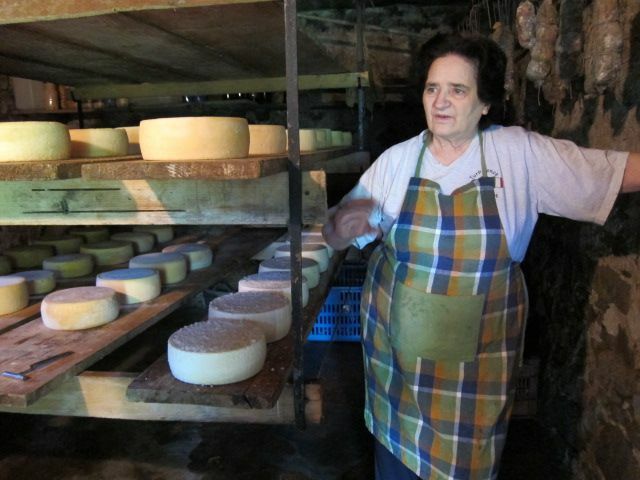 Heather’s knowledge comes from her love for the Garfagnana and its people and it is infectious. Thank you so much for organising such a wonderful tour. We all had a great trip! As much as we have enjoyed everything that we have seen, and done (and eaten), the best part is who we have met and shared stories with. I want to thank you so much for the wonderful week we had with you. It was so much fun. I’m telling everyone about it.